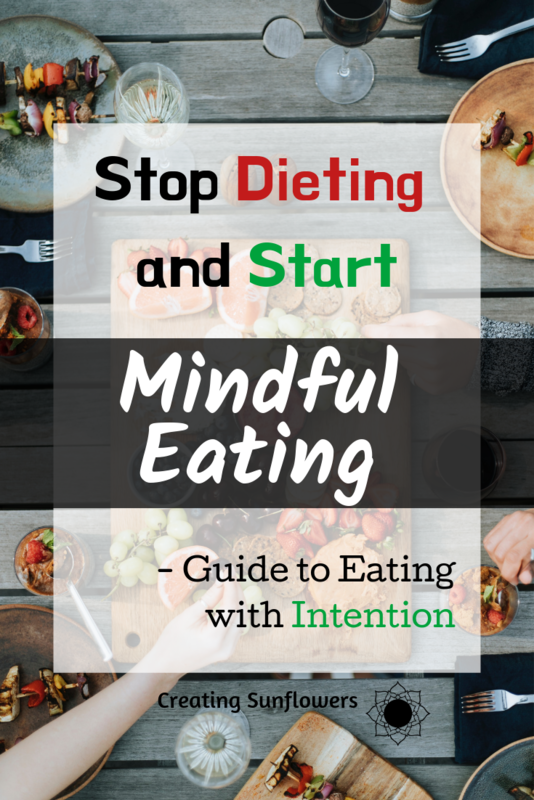 When you practice mindful eating and learn to eat with intention, you can heal your relationship with food and slow down to really enjoy your meals. Mindful eating is a powerful practice that can transform the way you look at food. I used to rush to get my food down, eat all the less exciting parts like veggies first, then scarf down all the carbs and protein. All this left me with was an overly full stomach and no more food. I used to justify this behavior in that I’m just making sure to eat my food before it gets cold. What a silly reason to make myself uncomfortable. Eating, for me, used to all about getting the food on my plate, in me. I used to believe that eating was such an inconvenience and that if I could just take a pill to get all my nutrients I would. Even if I had spent the time to make sure that the spices were just right or after carefully peeling my veggies. But I wasn’t ready to commit to eating my meals in silence. So mindful eating didn’t feel like it was in the books for me. Meditating while eating my food… no thanks! Mindful eating is not meditating though. 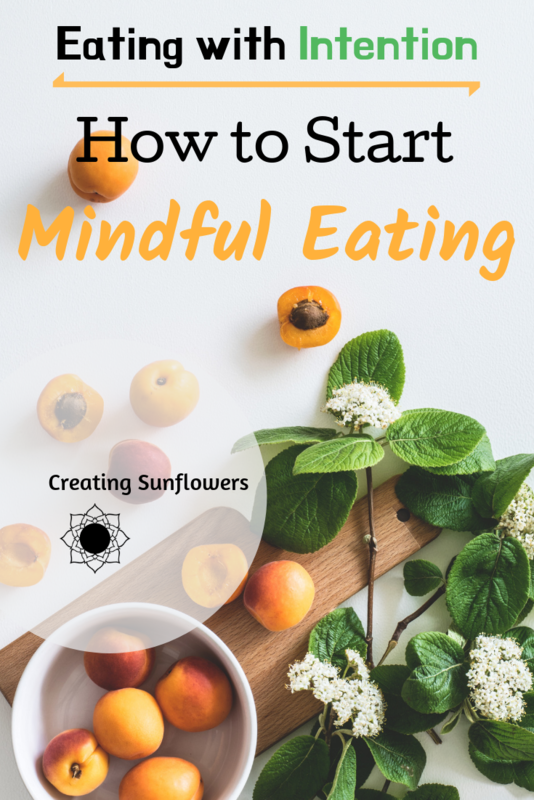 Mindful eating is an all encompassment of the act of using awareness to pay attention to the ingredients, the preparation, and the impact your meals have. That part I can get behind. I already pay attention to the ingredients in my food, I try to be aware of the sugar I’m consuming, and I follow a vegan diet. So paying more attention to my food shouldn’t be hard, right? So I tried mindful eating a few times and you know what I found? Paying attention works but only if you can keep coming back to it. It’s not sustainable to try to eat every meal in silence or even chew every bite 40 times. But… mindful eating works. I didn’t lose any weight and I never had any wild epiphanies about the way I eat. Instead, I still eat in front of the TV or with my phone in hand but sometimes I catch myself. I notice that I am starting to eat too fast so I take a couple of bites to count the number of times I need to chew my food. I stop myself at the grocery store from picking up food that I know contributes to environmental or health issues. I take time to smell all my food while it cooks. I let cooking and consuming food be more than just the act of getting nutrients. I pay attention to the food I’m eating and enjoy eating. Mindful eating is the act of eating without distractions and slowing down to enjoy your food. Mindful eating is a practice similar to mindfulness meditation in that you are taking time to observe an experience. While encompassing yourself and the food that you are eating, mindful eating can actually include what impact your food has in the world. Like where the ingredients came from, how the ingredients got to you, or who grew the food. While mindful eating can be rather complex and have many different layers, learning how to apply it for every meal doesn’t have to be. Instead, it can be paying attention to how the food tastes, the textures, and the way it smells. Paying attention to how you feel along the way is also important. Your body and mind connect through food when practicing mindful eating. Mindful eating can actually start when you are preparing and cooking food. You should pay attention to how everything feels as you are cutting and preparing your ingredients. Does anything have an immediate smell? What about once you start cooking it? What do you smell? Once you have finished cooking your meal and you are ready to eat, portion yourself off a smaller portion than you would normally have. Before you sit down, make sure that there are no immediate distractions. Along with not sitting in front of the television, you should also ditch your phone. Take a moment or two before digging in to express gratitude for your meal, the attention it took to prepare it, and the journey that the food took before it got to you. Take your first bite and chew thoroughly. Chewing your food 30-40 times would be best. While chewing take time to note any flavors and textures that you notice. Is it sweet? Is it spicy? Is it crunchy or soft? Take your time to finish the remainder of your food, all the while noting what aspects you come across. If you are eating with others it might seem a little weird to sit in complete silence while you eat, in this case, dedicate a few minutes or a few bites to a more aware eating approach before talking with your table mates. Remember to check in with yourself periodically, in this case, to not get too sucked into your old eating habits. As you begin to near the end of your meal, it is important to check in with yourself and your body. How did the food make you feel? Was it food that made you happy? Why or why not? How does the food make you feel physically? Do you feel energized? Was it food that made your body happy but not your mind? Or vice versa? Are you satisfied or looking for more? Mindful eating does not have to be a complex project to complete for every meal. It can be adopted into your normal food practices to help you strengthen your relationship to food. By practicing the whole act of mindful eating you can learn through awareness where your relationship with food suffers. From this, you can then adopt small pieces of mindful eating into your everyday practice. By taking the time to acknowledge where your relationship with food is you can begin to heal it. If you find yourself rushing through meals, mindful eating can teach you to make healthier food choices and make eating more of a ritual than a chore. You have the ability to rework your relationship with food by paying more attention to the food you eat, where it comes from, and how it makes you feel. Your mind is your most powerful tool in making the right choices for your body and the world. Mindful eating gives you the awareness needed to see the changes you need to make. When you take time to slow down and connect with yourself and your food, you can create a connection that fosters a healthy relationship. Mindful eating can transform how you look at and enjoy your food. When you eat with intention you not only feel better but are more aware and more likely to make good food choices. To forgive is to free yourself from anger and hurt. Without forgiveness, it is too easy to get caught up and stuck in negative emotions. By allowing yourself to acknowledge and release pain, you give yourself the gift of a blank slate. When we can extend that feeling to others, we can help to heal the other person and our relationship with them. Forgiveness can open up many opportunities, you just have to be ready to let go. Forgiveness is a fundamental piece of learning to let go and of growth. When you dwell on the past, it can be nearly impossible to feel at peace. By acknowledging and then releasing negative emotions, in the form of apologies, you can help to create an environment where past mistakes don’t control the narrative. When you offer forgiveness to yourself and others you are clearing an emotional block. By having a space free of emotional blocks, you can be more open to experiences and your relationships can flourish. It can feel hard to allow yourself to forgive but your world becomes happier when you do. Are you looking for more ways to improve your life? By subscribing to my newsletter you get access to my list for everyday success and a habit tracker. Start your day right with both today! Forgiving others can have large impact on others and your relationship with them. Sometimes when you are holding onto a lot of resentment for someone, you can find it hard to be around them. They probably can tell that there’s some kinds of issue. Maybe they have even tried apologizing. You don’t need to go around forgiving everyone for everything that they have ever done that affected you but you can start to forgive the small things in private. Forgiveness doesn’t always need to come in the form of an apology, sometimes is can be just the acknowledgement and act of letting something go. When you become a forgiving person people feel more comfortable around you and your relationships can be strengthened. People might feel like you’re easier to be around or even that you make them excited to see you. When you stop holding the past against someone, you can begin to look past their mistakes and shortcomings. When you allow yourself to let go of negative feelings and guilt you can become infinitely more happy. Forgiving yourself can be hard but it can be harder to be miserable. By holding onto feeling and memories that cause you to feel bad, you encourage those feelings to stick around. By acknowledging and accepting negative thoughts and feelings you can begin to understand and free yourself from them. When you face a difficult situation accepting that you can and will make mistakes can leave you open to more growth. Having the confidence to make a decision, whether right or wrong can be easier when you are not held back by the “bad” choices of the past. Learn to see every situation as neither positive or negative, instead look for how every situation can be a learning experience. Look for opportunities to grow and be aware that they can be presented in many different ways. Your negative feeling towards others can especially have an effect on your well being. It can be all to easy to feel angry or upset with others when you perceive them to have made a mistake. When you let that anger fester and build it starts to seep into you and you start to feel consumed. By separating yourself from others and not getting caught up in something that they have done or done to you, you can become untouchable and not phased. By acting with an intention of forgiveness, you are able to shape your relationships and in turn the world around you. Forgiveness gives you freedom and the ability to live in the moment. When used from a place of love and care, you can heal your relationship with yourself. Forgiveness opens your heart to the act of being free; free from hurt, negative emotions, and the past. Release yourself from the negative emotions and patterns by allowing yourself to forgive. To feel free of worry and upset you must learn how to offer yourself forgiveness. Learning forgiveness can feel confusing, even more so when you don’t feel able to let go. The power of forgiveness can be huge in releasing worries and help you to find inner calm. 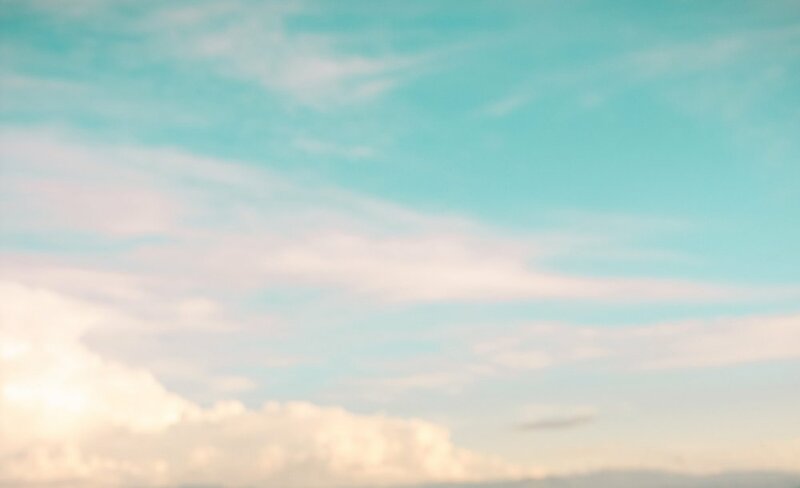 Live more in the moment with these 5 tips for forgiveness. Forgiveness is an often overlooked tool for healing. When you normally think forgiveness you probably don’t think about offering it to yourself. Surprisingly enough you and the most important person in your own life and to spend time on your shortcomings would be a waste of your time. When you allow yourself to let go of your past mistakes, you can really start getting to a healthy place with yourself. Forgiveness is the first step to growth, as you cannot expect to become a better person while still dwelling on your past. Learning to let go can help you get the most out of the relationship you have with yourself. Sometimes it's hard to imagine being nice to ourselves when we feel unworthy of forgiveness. When we practice forgiving others it is kind of like training a muscle, and it can become easier to imagine a world where we don’t carry guilt. Practicing forgiveness is something you can do in many ways. You can send a message, meet face to face, or even just in your own mind. Forgiveness can be as much about you as it is about others. Instead of jumping to your worst memory or thought, try looking for a small mistake you may have made instead. It can be a lot easier to learn forgiveness when you aren’t trying to heal a major source of hurt. Pick something that you feel that you can easily separate from yourself and let it go. Apologize to yourself for not washing the dishes or forgetting to pick up groceries. Starting with something small can help open the gate for deeper emotional healing. A major part in forgiving yourself is the awareness that you are feeling guilty or stuck in a negative thought loop. When you feel yourself getting sucked into a moment that is not the present one, take a second to reconnect by checking in with yourself. This could be done in a multitude of ways; body scan, focus on your breath, mindful meditation, etc. By breaking the vortex that your negative thoughts can become you are breaking a pattern of thinking. Awareness is the first step to finding your source of hurt. Once you are aware of what is causing you to hurt, it’s time to free yourself from it. Holding onto negative emotions will not help you get happy. Let yourself feel any emotions that come up but also be ready to let them go when they no longer serve you. If just letting an emotion go seems difficult you can try this shower meditation. Using visualization you can learn to let your emotions wash away. Sometimes even after letting go of a mistake, it can still seem to hang around. When you take a moment to reframe the memory you can change the feeling around it. Learn to look for the things you learned from the experience. Becoming grateful for what an experience has given you is the ultimate goal in learning to forgive yourself. What do you need to do to get it right next time? What lesson has this experience taught you? How can you improve despite maybe screwing up? Learn to stop feeling bad about your choices and instead start looking for the good. When you break the cycle of anger and negativity towards yourself, you can really begin to start healing. Offering yourself forgiveness allows you to find peace with yourself and in that ultimately, happiness. The power of forgiveness allows you to live in the moment and can reframe negative experiences. Free yourself from worries and stress by learning to forgive yourself.